In Mario Jardel, Bolton Wanderers had signed a striker with a phenomenal goalscoring record in European football. At the time it was a slightly unreal situation seeing a fee of just £1.8m had secured the services of a forward who was feared across the continent. At Porto he had scored 166 goals in just 169 appearances, he moved then to Galatasaray in Turkey and scored 34 goals in 43 appearances before returning to Portugal with Sporting CP where he again broke records scoring 67 goals in 62 appearances. It was here that Jardel won the European Golden Shoe, in the 2001-2 season during which he scored 42 goals in 30 league games. However, it was not long before things began to take a downward turn for the player. A move to Spanish giants Real Madrid collapsed at the last minute and it is now believed that he suffered from depression which in turn led to him turning to drink and drugs to cope. A freak knee injury suffered at his home in Brazil in 2002 meant that he spent the majority of the season injured, only scoring nine goals. In August 2003 he moved to England and signed for Bolton Wanderers on a two year contract at the time when manager Sam Allardyce was garnering a reputation for ‘housing’ lost souls and turning careers round. He had done similar work with Youri Djorkaeff and Jay-Jay Okocha – bringing them in on free transfers whilst paying large wages to attract these stellar names to Lancashire. Jardel’s Bolton Wanderers career was to prove a disappointment. He was half the player that he had been in the early 2000s – though in some respects he was twice the player. Injury troubles and fitness concerns led to the gaining of an unfortunate nickname ‘Lardel’ being a pun on his apparent weight problems. Off the pitch he was known as a quiet and unassuming character, on the pitch he was similarly quiet. His time at the club is best remembered for two moments. A brilliant headed goal against Liverpool at Anfield helped Wanderers on the way to the Carling Cup Final that year, which compared with an incredible miss against Gillingham in an earlier round showed the frustration that the fans felt. Clearly he was a top striker, but his troubles had caught up with him. Indeed the Wikipedia article on the player covers his time in English football under the heading ‘Decline’. 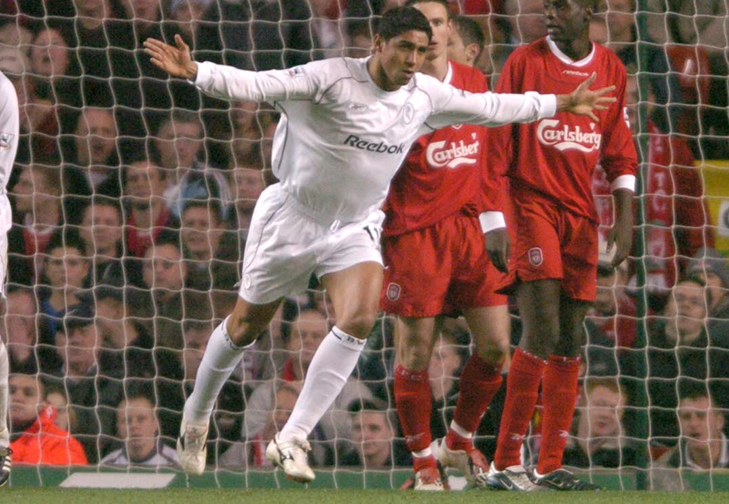 Mario Jardel left Bolton Wanderers in 2004, spending the remainder of his career in relative obscurity with moves to Italy, Australia, Bulgaria and eventually back to Brazil, retiring from the game in 2011 with a great sense of ‘what might have been’. This entry was posted in The Samba Series and tagged bolton wanderers, brazil, mario jardel, reebok, sam allardyce, samba series by The Samba Series. Bookmark the permalink.